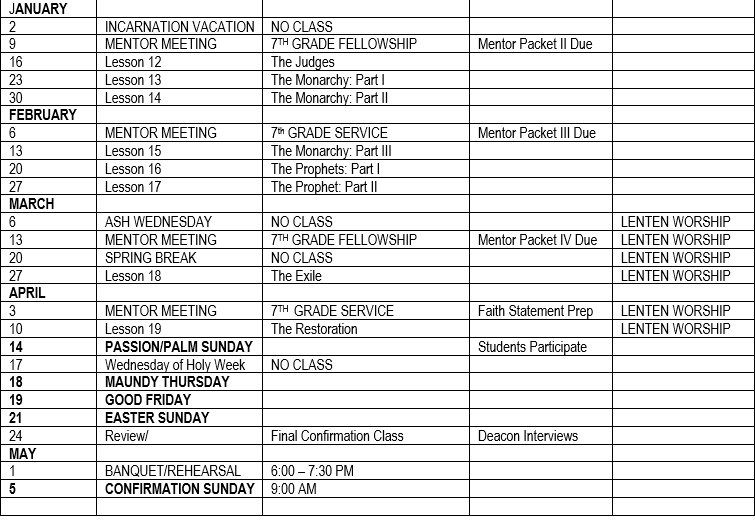 Confirmation meets on Wednesdays, from 5:30-7:30pm, for grades 7th and 8th. We come together for a meal, prepared fresh each week provided by members of our generous congregation, then break off for the lesson. Throughout their time in confirmation, the youth will learn both Old and New Testament, Luther's Small Catechism, find a mentor, do service projects, and have fellowship time. The first Wednesday of each month, the 8th graders will meet with Pastor Dave and their mentors, while Tiffany will team up with a parent and the 7th graders to have fellowship time, or help them complete a service project. ​Students are put on an acolyte schedule, which includes sound and running the PowerPoint, and are required to attend Sunday Club with Tiffany and Lavonne. In that time we will discuss the sermon from that morning, do activities, or team up with the high school students to do a service project. We are going to keep them involved and excited about the love of Jesus! The 7th & 8th grade students are a dynamite group of kids! They are chomping at the bits to be involved in spreading the love of Jesus within our community and beyond! We are working to get them more involved by involving them in fundraisers, more service projects, mission trips and events!